The growth of India’s infrastructure industries slowed to an 18-month low in December, brought down by coal, crude and fertilisers. The index of eight core industries rose 2.6% in December, the lowest since a 1% expansion recorded in June 2017. The core sector had grown 3.4% in November 2018 and 3.8% in December 2017. The eight infrastructure sectors of coal, crude oil, natural gas, refinery products, fertilisers, steel, cement and electricity, constitute 40.27% of the total industrial production. The latest data suggest a moderation in industrial growth going ahead. In November, industrial production growth had slowed to a 17-month low of 0.47%. The industrial production numbers for December will be released on February 12. Core sector growth for April-December was 4.8% against 3.9% in the corresponding period of the previous year. 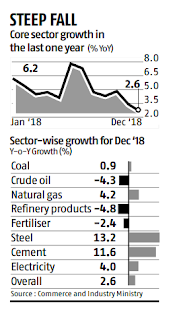 Coal output growth slipped to 0.9% in December from 3.7% in November, also dragging down the expansion in electricity generation to 4% from 5.1% a month before. 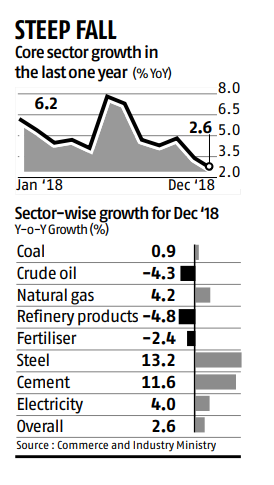 Production of crude oil, refinery products and fertilisers shrank in December from a year earlier, declining 4.3%, 4.8% and 2.4%, respectively. In the case of refinery products, which has the highest weight in the index, this was the first contraction in 16 months. Steel output growth accelerated to 13.2% from 5.8% in November, while cement production was up 11.6% from 8.8%.